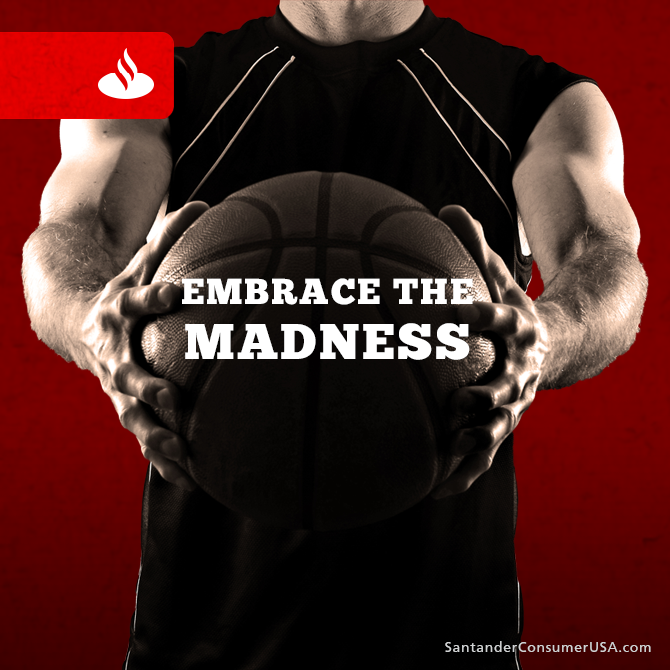 With three weeks of potential bracket-busting competition ahead, Santander Consumer USA has your ticket to college basketball’s big dance. We’re taking the court for our annual March Madness contest, and we want you on the team. If you’ve entered before, you know the drill, and, if you haven’t, it’s time to suit up. Will your favorite team get in? Will the top seeds dominate? Which favorites will go down in early upsets? And who will be this year’s Cinderella story – remember the Wichita State Shockers and Florida Gulf Coast Eagles in 2013 or the Dayton Flyers in 2014? Make your picks immediately after the Selection Sunday show March 13. You have until 12:15 p.m. ET on Thursday, March 17, to sign up. It’s a great time with a shot at winning some mad prizes. There are two ways to log in. If you can’t remember your log in information, you can retrieve it at http://www.runyourpool.com/forgot.cfm. Don’t forget to review your pool settings. Once you’ve filled in all of your information, select your teams and tune in to see who will take Houston by storm in their race to the Final Four. Winners for each round will be announced throughout the tournament. March 13 (Sun): Selection Show on CBS at 5:30 p.m. ET, after which the pick sheet opens. Log in and set up your account today. You have the chance to take home some great prizes. The game clock will start soon; don’t miss your chance make the big play. Stay on top of all the action and winners by liking us on Facebook. No purchase necessary. Void where prohibited. The contest ends April 4, 2016. Participants are subject to “player rules” as described on the RunYourPool.com dashboard. To view official rules, visit https://santanderconsumerusa.com/wp-content/uploads/2016/02/mm16.pdf.